Intrigued about the Go&Flows. I am one of the rare few for whom the Zone ins worked. For some reason they are flattering for my body type, though I did have problems with a crotch seam in 1 of my 4 pairs. 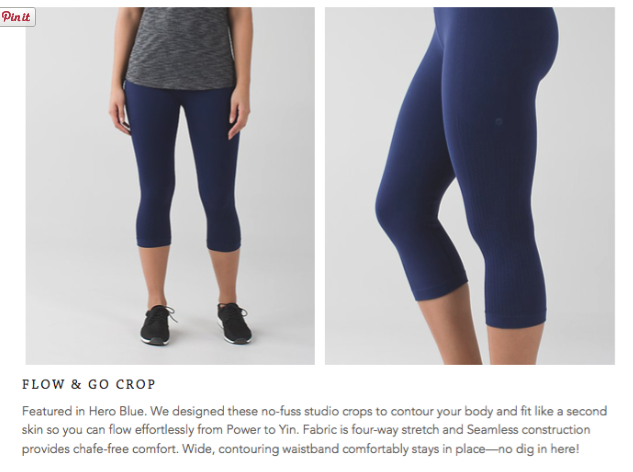 I love the In the flows, but am noticing that the waistband is getting looser and looser with each wear to the point that I am constantly tugging at them during yoga. Hopefully these ones will fix that. If the four items showcased in What We Love is the best they have to offer... that's super depressing! Aww, looking at that picture of the vintage piece really makes me miss the old days of unique and beautiful design. I think they just crank out too much now, every week there'a a new launch. I mean, I know that they are only catering to whet we've come to demand of them: More, more, more! We want more and we want it now! And then we all complain that it's boring and repetitive. Well, what did we expect? Back in the old days, they didn't have to drop new products every week. It was quality over quantity. I miss the old quality, but I'm implicit in the downfall for expecting a constant barrage of new stuff every week. Not that I really even buy much any more. Why are there all of these skinny strappy tops that show off almost your entire back???? They are all so similar. I find more and more I'm less and less impressed with the WWL updates. So far i've now skipped Tuesday upload and now WWL upload. I still like a bargain so check on Thursdays for WMTM. I finally feel like i'm not missing out on anything so yay for that! 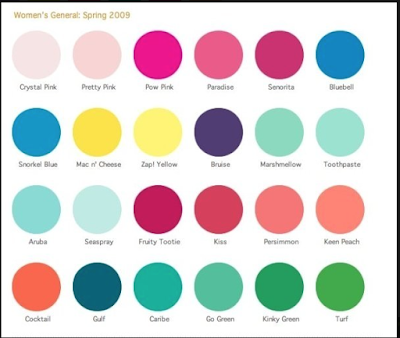 I want paris perfection back - and not in a polyester CRB please :P Pow Pink was close. I need more pink in my life but I don't know if i'm a fan of this specific pink. It looks similar to Pink Lemonade which I promptly returned as I did not like the weird shade of that one. Well lulu just killed my other favorite pant....the in the flows. First they ruined the studio pants and now this. I love the length of the in the flows....have one pair in the original version in this past the knee length and hate them. Well I guess they are either saving me money this year and/or forcing me to look elsewhere. LLA- do u know the other pinks featured in that pic with the crb? @ anon 2:33 pm- I think they changed the finish on the fabric on the Aligns. I tried them on when they first came out and they felt sticky to me - almost like a microfiber cloth. My primary impression was that they were so soft they would suede easily, which many have done. However, I tried them on again a couple of weeks ago and the feel is noticeably different now. It's a bit more slicker. I definitely think they changed the formula a little. I think a change would account for why people have different experiences with regards to sueding and pilling with the Aligns. I'll buy a pair as soon as they come out with crops. I don't understand why there are no Align crops yet. @ anon 8:11 pm - I know. I really like the two pairs of In the Flows I have. The Seamlessly Streets weren't bad either. 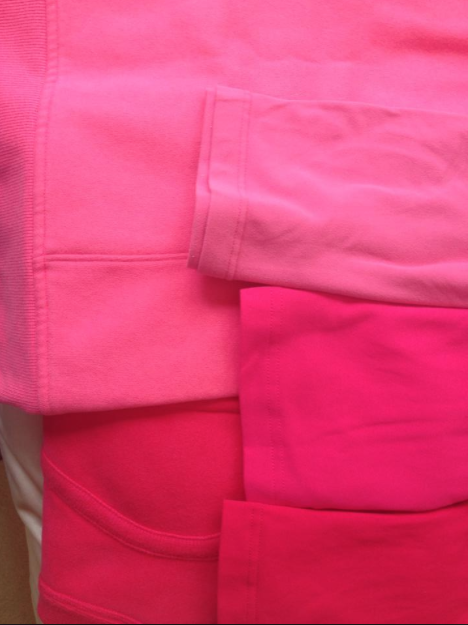 Re: the other pinks - Top Left - Pinkelicious Scuba, Bottom left: Bon Bon Scuba. Top Right: Paradise CRB, Middle Right: Senorita CRB (Jeweled Magenta is a Senorita dupe), and bottom right: Fruity Tootie CRB. I'm so perplexed by the business plan: identify all great sellers that draw people to the brand and discontinue them. Replace them with generic cuts that can be found at all our competitors. In the Flows don't work on me (they hit right at the knee), but everyone LOVED these. Just as they, and I, loved Studio Pants, Pace Setter skirts, 105F tanks, Still pants, and lots more. I know. I came to lulu BC of the studio pant. The tapered leg in the IIi's won't work for me (plus I'm not liking what it's going to people's butts in photos) I'm bummed I had to spend money sticking up on studio IIs. Plus the price hikes. I'm definitely loosing enthusiasm. Anon 3:52 I agree with you about all the tanks that show so much back, Wild Tank, Lighten Up Tank, Nouveau Tank. I would love to see the Stop At Nothing Tank come to Canada, if it doesn't I am going to be very upset and will boycott LLL this summer and go elsewhere for my tanks. Check out Hong Kong site for tanks, they have so many more than Canada and US, I like the look of the Daily Practice Tank in surge blue but will it come to Canada??? I didn't read the commentary at first that you did with the pieces, I just scrolled through to see what will be new. I got to that tank, and my heart skipped and I thought "I guess there IS something I want!!" but no. It's merely a flashback to happier times. That tank is beautiful, and what a contrast to the current offerings!! Blah, blah, and blah. My scrolling now will continue. The zone in crops and pants were so awful that they were not even selling quickly for $19 at my Canadian store! I am a petite size 4 and looked horrendous in these! This is anon 8:11. I just realized probably one of the main reasons for this change...to justify a price increase for "new" version. The other day I remember thinking I was glad the in the flows (solid) remained at 78 since I think 88 would be too much for them. Well we can almost guarantee this new version will be 88-98. I loved my In the Flow crops - they were flattering and seemed pretty much indestructible, never pilled, I even got velcro stuck to them and nothing happened - for about 12 months. Then they developed huge crotch holes, and this was with relatively gentle use. According to the reviews it looks like this is a common problem within 6-12 months. I returned mine (the second time I've returned something to LLL because it didn't perform as hoped, the other was a Swiftly that ran the first time I wore it) and they replaced them with another pair of the same without any questions at all. I'm pleased to have another pair, but also worried that the new pair will develop crotch holes. 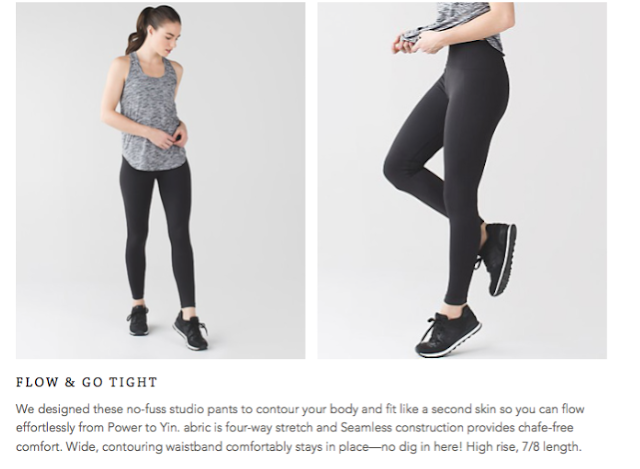 I think this might be a general problem with seamless, since I have a Nike seamless top that's done the same thing in the armpit after gentle wear for a couple of months. This is a long way of saying that I hope they've solved the crotch hole problem with the new seamless pants, because I love the LLL seamless material and styles otherwise. The sneak peaks again leave very little to be desired. Might be another week purchase free. I also tried Aligns during the week they released and HATED them. See-through even in a size up, massive ankle gapping, and made my booty look flat as a pancake (and I'm pretty curvy!) I tried them on again and purchased about two weeks ago - I got a size down and they are opaque, very little gapping at the ankle, very flattering, and so far no pilling. My bit concern is that they attract *so much* lint, so I have to lint roll constantly or else feel embarrassed at my black leggings covered in white bits. @ 8:49 am - My black swan In the Flow crops got a hole in the seam of the crotch after very light wear but I brought them in to be repaired and they seem ok so far. I didn't want to exchange because I'm pretty particular about the color of the In the Flows I get, some work for me and some give me weird crotch shadowing. The Zone In pants, with the new seamless material, also got holes in the crotch seams, too. @ anon 11:46 am - the lint issue is so annoying. @ anon 10:07 pm - Agree 100%. I still have the Move tank, too. I'm sorry but is the picture of the Move tank supposed to be an example of Lulu being better in the past? OMG what is up with that old lady pattern and the weird stitching under the bust? The quality was absolutely better in the mid to late 2000s but that top is hideous. Is paradise pink close to pink lemonade? This is anon @ 3:52 - to anon @ 5:11 - I am waiting for the stop at nothing tank too! The pictures of it make me think it's perfect for me. Shows cute bra straps at top, but mostly full back coverage. Skimming but not too baggy or long, and not too tight. I would have bought several if they were in the US. I don't know why we don't have one option like that. I agree with 10:11 it's funny what nostalgia can do to a person. that top is hideous and the color combo is odd. what year was that?